For six years I entered the London ballot. I’m not sure why, as the idea of training for a marathon, let alone running one was never a thought I’d entertained! In my teenage years, I was an 800m runner, so I’ve always had speed, but struggled to maintain any form of endurance. If you had asked my friends who was least likely to do a marathon they’d have unanimously said “Connor” (all whilst laughing their heads off!!). 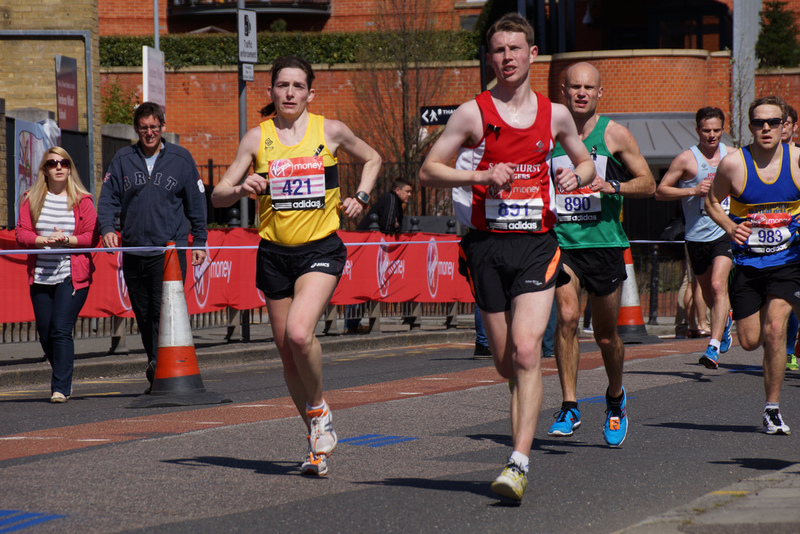 When I was eventually awarded a London marathon place, I planned to run with my mum, Paula. She would drag me out of the house in the early hours of the morning for long runs, motivate me to eat well and be my pacer on marathon day! Unfortunately, when I did get a place she had to withdraw due to injury and I then moved from Sandhurst to Oxford for a new job, so that plan was quickly thrown out the window! Still determined to get around London, I began my training in January with some like-minded runners from Alchester Athletics club. Considering I hate long-distance running, training was going surprisingly well! I increased my long runs by two miles each week, consistently running 9-minute mile pace and managed to comfortably run up to 18 miles by the end of February. At this point I was starting to look forward to the marathon and thought I might scrape under four hours. In March, things quickly took a turn for the worse. I ran the Big Half marathon in London and throughout the race I experienced pain in my hips and knees. I assumed this was down to resting and inactivity during the week in preparation so thought nothing else of it. The following weekend I attempted to run 20 miles, however after 10 I was suffering again with tightness and inflammation in my joints and despite walk-jogging a further 9 miles, I had to stop. A few massages later, I was diagnosed with Iliotibial Band Syndrome, which is an overuse injury that occurs when the ligament that runs down the outside of the thigh from the hip to the shin, is tight or inflamed. My planned three-week taper quickly grew to six. Without the option to defer, I knew that I had to try and remain positive, so I continued to stretch, rest and hope that my ITB would settle down. Sadly, not the case, and so come marathon day after four miles of running I had to accept that I would be walking the majority of it. Whilst it wasn’t ideal being out in the sun and on my feet for so long, quitting was never an option. I kept reminding myself to enjoy the day where I could and get to the finish line. I stopped to see my friends and family along the course at miles 9, 19 and 23 which was great, and the crowds were as incredible as everyone describes them! I definitely appreciated their support, although I must admit I did start to regret having my name printed on my vest. I kept wanting to say to everyone cheering me on “I promise I’m not tired or being lazy, I’m injured!! !”, but I know they were only trying to be helpful. I embraced the crowd’s kind offers of apple slices, ice pops and jelly babies along the route and was relieved when I finally made it to the finish line. Now back home, I hope to work on overcoming my ITB and focus on shorter distance running. Perhaps one day I will do another marathon, although I think having the company of a fellow SJ runner or two along the way will do me good! Thanks to everyone for their words of encouragement, particularly those on the bus in the morning and shout out to Paul Biggs for his support in the blue start area.